I read you link. Despite what it says, I don't believe it can be claimed that the A30 was based on a folkboat. Yes, it was commissioned by some folkboat owners, but to be based on a folkboat or even inspired by a folkboat, to my mind it needs to exhibit some of the characteristics of the folkboat that set it apart from the average yacht of the times. I can't see any in the A30. A nice boat, but to my mind a very different beast to the folkboat. Jackett, are you limiting your comparison to only hull shape? If so, have a look at the design ratios, things like sa/displ., prismatic coefficient, etc. Sometimes remarkably different looking boats can be surprisingly similar in non-dimensional comparisons. 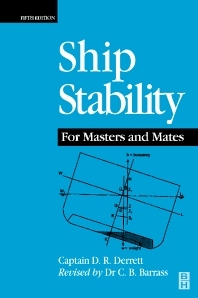 Mmd, now I see why the title of the Ship Stability for Masters and Mates is titled like it is. That's critical stuff for the management portion of a ship's crew to understand in order to maintain control of their vessel in a world that shifts on them all the time. I do enjoy the book, even though I've only read the first couple of chapters, but I scanned forward through it and I noticed the rest of the book, just like the first two chapters, focus only on what would be boats powered by an engine. The examples it has given in the first two chapters are mainly just focusing on the hull of a boat. The exception would be where it talked about suspended loads. That part actually was very helpful to think about how the wind loads are imposed on a sail boat. This is probably going to get some ridicule from those following this discussion but here comes the question anyhow. Would I be safe to say that the loads imposed on the sail boat from the wind, outside of the centerline of the boat, would be the stays, shrouds, sheets, and downward loads imposed by the mast? I know there is some some wind load imposed on the hull directly but I would think that wouldn't be considered in an analysis since it isn't the primary source of wind loads. Also, just writing this, I guess equal loads, except when running downwind, would also be imposed on a hull by the force of water acting in opposition to the wind loads where the net difference would account for the heeling of the boat. The suspended load portion of chapter 2 helps visualize how the loads through the stays, shrouds, sheets would be an upward load on the hull at those attachment points, just like human ballast on the rail would be a downward load. I'm wondering if that is correct? Going through the exercise of reading a book like these two you've recommended will give a person a REAL appreciation for what an individual(s) has to sort through to design a boat, and that's just a small part of it. For one person to do all of this, I wouldn't think they'd just be considered a naval architect but an architect/engineer. I'm also assuming the Coast Guard probably requires individuals who offer commercial services in the marine industry where they would be responsible for lives on board and cargo to have a competent understanding of these topics. If not, they should. An example would be earlier where I mentioned my experience being on crew boats going and coming from offshore construction sites, and working on those sites. If the captains of those boats allow their boats to be loaded in ways that are not safe, i.e. position of cargo, overloading, not being able to competently analyze their condition versus environmental conditions, etcetera, then things could go very wrong. The same could be said for those offering charter services, or even just inviting others about their sailboat for a cruise. Anyhow, thanks a bunch for your advice, recommendation of books, and feedback! Having utilized it, and benefited from it, I greatly recognize the professional contributions you bring to this forum, and again, I appreciate it a lot! Not only does it recognize that professionals like yourself are out there for boat builders to utilize, but discussions like this very thread on this forum, because of your input, increase the level of knowledge for sailors, increase the level of safety in the industry because of that added knowledge, and raises the level of standards for this industry.